Occasionally, students of the wildlife of Florida need a longer format for publication of research results, reviews, species accounts, or basic reference materials than cannot be accommodated by the article format of the Florida Field Naturalist. The Society created a “Special Publications” series to provide such an outlet. The length of the Florida Ornithological Society Special Publications has ranged from 43 to 435 pages, and the rate of publication has been a steady one per decade since the 1970’s except for a burst of activity in the 1990’s with three publications. Most Special Publications are solely soft cover, but two have been published in soft- and hard-cover. If you have a manuscript that you would like to have considered as a Special Publication of the Florida Ornithological Society, please contact the Special Publications Editor. All potentially suitable manuscripts will undergo a peer review process. 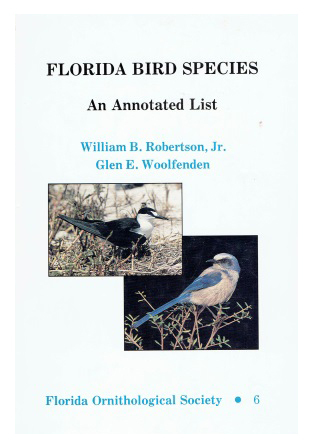 The Robertson and Woolfenden Florida Bird Species: An Annotated List. FOS, Special Publication No. 8. By Jon S. Greenlaw, Bill Pranty, and Reed Bowman. vii + 435 pp. 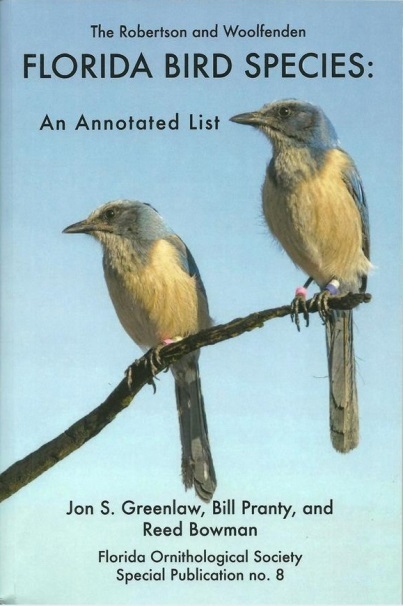 This volume is an updated and expanded second edition of a landmark contribution to Florida ornithology authored by two of the state's foremost students of birds. 2006. The Breeding Birds of Florida. FOS Special Publication No. 7. By G.E. Woolfenden, W.B. Robertson, Jr., and J.A. Cox. ii + 142 pages. 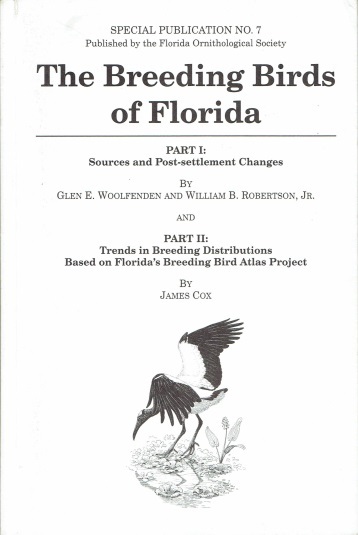 Objectives of the first chapter of this book include: "determine what bird species made up Florida's breeding avifauna at the time of European settlement, determine the source areas for the species that make up this avifauna, and to identify and discuss the major changes in the avifauna since, and largely because of, European settlement." The second chapter concerns a comparison of bird species distributions to the distributions of climatic, cultural, and ecological features. A summary of the status of Florida birds species co-authored by two of the state's foremost ornithologists. 1991. 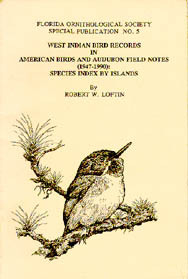 West Indian Bird Records in American Birds and Audubon Field Notes (1947-1990): Species Index by Island. FOS Special Publication No. 5. R.W. Loftin. ix + 90pages. 1991. 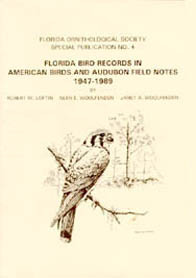 Florida Bird Records In American Birds and Audubon Field Notes (1947-1989): Species Index and County Gazetteer. FOS Special Publication No. 4. R.W. Loftin, G.E. Woolfenden, and J.A. Woolfenden. xiv + 99 pages. 1987. 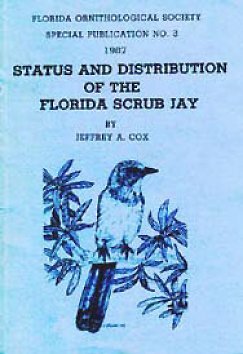 Status and Distribution of the Florida Scrub Jay. FOS Special Publication No. 3. Jeff A. Cox. vii + 110 pages. 1985. The Carolina Parakeet in Florida. FOS Special Publication No. 2. Daniel McKinley. vi + 65 pages. 1978. 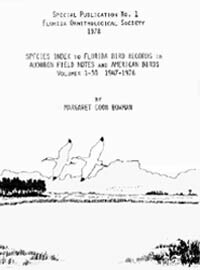 Species index to Florida Bird Records in Audubon Field Notes and American Birds, Volumes 1-30, 1947-1967. FOS Special Publication No. 1. M.C. Bowman. xii + 43 pages. OUT OF PRINT. The amount of the check should include the price of the publication(s) plus shipping and sales tax. Shipping: Add $2 shipping for 1-5 copies; $4 for 6-10 copies. Sales Tax: Florida residents add the sales tax for the county in which the special publications are being delivered. Calculate the sales tax based on the total cost of the special publications plus shipping. For questions on calculating the cost of an order, please contact the FOS Treasurer. For questions on availability of special publications, please contact the Special Publications Editor. Jon S. Greenlaw, Bill Pranty, and Reed Bowman are the authors of the latest FOS Special Publication. 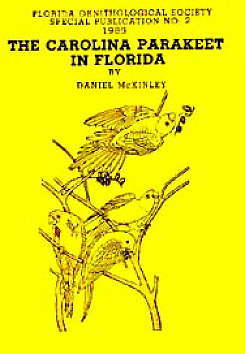 This definitive edition includes Florida's 516 native, visiting, vagrant, and established exotic species, and just over 300 exotic species that are known from free-flying but non-established. The second edition represents a complete reworking of the first edition by Bill Robertson and Glen Woolfenden, while maintaining the foundational goals and overall formatting set forth by Robertson and Woolfenden. The Carolina Parakeet in Florida.